A First Nation in northern Saskatchewan says oil from the Husky Energy pipeline leak has shown up in the spawning grounds of an endangered species. 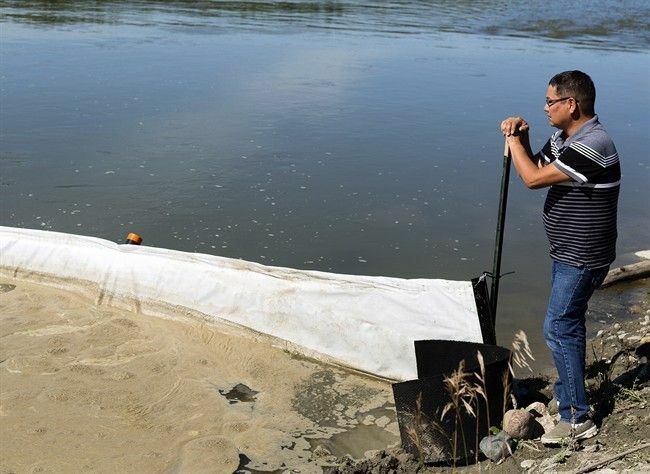 Officials from James Smith Cree Nation said an oil plume and foam was discovered in the Saskatchewan River where lake sturgeon spawn. The Committee on the Status of Endangered Wildlife in Canada said the fish are an endangered species. Chief Wally Burns said the First Nation, about 60 kilometres east of Prince Albert, ordered residents to not swim, hunt, fish or gather along the Saskatchewan River after the contaminant showed up Aug. 21. Water samples taken by Saskatchewan’s Water Security Agency on Aug. 18 found the foam contained at least one component of petroleum exceeding sediment quality guidelines. It took more tests on Friday, after the most of the plume appeared on the First Nation, and are waiting for the results that can determine if the material is from the Husky spill. Husky’s pipeline leaked last month near Maidstone, Sask. into the North Saskatchewan River. The pipeline was carrying heavy oil mixed with a lighter petroleum product that enables the crude to flow. The North Saskatchewan and South Saskatchewan rivers meet just west of the First Nation and become the Saskatchewan River. The province said last week that almost 75 per cent of the estimated 225,000 litres of petroleum that spilled has been recovered. The Cree First Nations said it has taken its own water and soil samples for testing for hydrocarbons and point of origin.